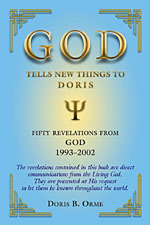 The revelations contained in this book are direct communications from the Living God. They are presented at His request to let them be known throughout the world. How we shall pass through the Final Judgment - including the role of the United States and Great Britain and all nations. God honors Dodi Fayed and Diana, the Princess of Wales. God's amazing plan for mankind. The direct dominion of God's Love. God returns to the Earth for you and me. God speaks about the tragedy of Sept. 11th. The New Jerusalem - God's final triumph. The fifty revelations explain the great changes taking place in the world. All nations are being shaken out of their complacency. God wants to advance your thinking and help you understand the depth of His thoughts and desires at this wonderful, emerging time in history. Although the world seems as though it will explode at any moment, God explains why this must take place. In order for the Kingdom of Heaven to come on earth, there must be a complete purging of the entire world, and all evil must be exposed in every nation in order for righteousness to prevail. Nothing shall be hidden, as it was so aptly said thousands of years ago: "They shall run for the rocks and the hills and find no place to hide." God is creating a New Heaven and a New Earth. It is time to understand His tender words of love as He welcomes us all home while He turns the world upside down and right side up. Within Me there is both a Father and Mother's love. In creating Adam and Eve in the beginning, I made them in My image which is both male and female. I intended that the first woman - Eve - reach a love so strong for Me that no temptation could ever take her away from My love. However when Lucifer tempted her and she fell under his dominion of self-centered love, she in turn tempted Adam and Adam lost His position with Me by uniting with her. As a result My plan was thwarted. For perfect love to exist on the earth, freedom must exist so that love can be freely given. Hence in My plan, men and women were both required to perfect themselves spiritually in loving Me first and in loving their neighbors. These were later expressed by My great commandments to Jesus - "Thou shalt love the Lord thy God with all thy heart, soul and mind, and thy neighbor as thyself." If mankind had not fallen, Jesus would not have come, because you would be living naturally under My eternal love. Love precedes truth. If you love music, you can understand the principles and nuances of music. Therefore, if mankind had not fallen, you would be living naturally with My Truth and My Divine Laws - the Laws of the Cosmos. You would naturally understand the eternal truths - you reap what you sow. All actions are recorded in the spirit and you cannot expunge one jot or tittle, but you can approach Me and life with meekness, learning in the process all there is to learn from life, and each other. Arrogance however blocks understanding, therefore only the pure in heart shall discern how I, the ever-present invisible God, manifests My Love. Yes, no matter what you believe, I had a plan when I created man and woman, and it was that they should dwell perfectly with Me as sons and daughters in My image and likeness. You are all to be My chosen people. All Adam and Eve had to do was grow into perfect harmony with Me. That basically is all that you have to do now. You must grow into a perfect relationship with Me so that My love can guide you through life. You would therefore return to living in My Direct Dominion of Love. The Femininity, in what you may call the Godhead which is the Mother aspect, provokes and stimulates the Masculinity of the Godhead - the Father aspect, who gives the seed of all life and love in the Creation of man and woman on earth, and all things that are created throughout the cosmos. Because man and woman are made in the direct image of Me, the rest of creation - the animal, plant and mineral kingdoms are made in the indirect image of Me. It is when man and woman reach oneness with Me in heart, that I will unite them in eternal Divine Marriage which will bring forth more and more love throughout the universe, because of their Divine Harmony with Me, the Father and Mother God. The fulfillment of the restoration of Man and Woman directly under Me allows mankind to see Me face to face and not through a glass darkly. Further, Man and Woman restore their direct Lord/Ladyship over the creation through their unity with My Love, so that the creation no longer has to groan in travail waiting for My sons and daughters to appear. It is vitally important that Man and Woman love Me first before they love each other. They must love Me with all their hearts, souls and minds and in so doing they will have an eternity of love for one another, which will far exceed any love they felt for each other before they reached completion with Me. There is no way that man and woman can ever love each other perfectly until they love Me perfectly. Jesus talked of mankind becoming perfect when he said: "Be ye therefore perfect as your Father which is in heaven is perfect." That is also why he said, "When that which is perfect has come, that which is imperfect shall be made perfect." This suggests that I-Myself will come to mankind and be with them, as I was in the beginning with Adam and Eve. I talked with them daily and nurtured them with My love and wisdom. If I did it then, why can I not do it now? Jesus after all said, "I would come and bring perfection to imperfect people." That is why Jesus also said, "Unless you become as a child, you would not receive the Kingdom of Heaven." When the man asked Jesus where the Kingdom of Heaven was, he answered, "The Kingdom of Heaven is in you." That definitely means that all people can have the kingdom within them, if they love Me with all their hearts, minds and souls. My promises are true and not an iota will drop from the law until they are accomplished. The woman, you can say, is the one who stimulates the man to love. When a woman loves Me with all her heart, soul, and mind and shows this unselfish love to her mate, he in turn will be drawn into a deeper love of Me which is beyond any love he has experienced with Me before. Then the two shall become One with Me, the Godhead which includes the perfect Father and Mother aspects. Therefore Men and Women - husbands and wives - who reach this Perfect Divine Love will never be lonely again, or long for any other kind of selfish love. They will find complete and utter contentment in their oneness with each other centered on Me, the Father and Mother God who made all things in the universe. They will be filled with joy and love for each other every day of their lives on earth as well as when they go to the spirit world. They will constantly be discovering new feelings of love and admiration for each other and never ever think of other men and women in this way. They are soulmates that never part throughout the eternity of time and are in My absolute image - the Father and Mother aspects of the Godhead - the Mother aspect of Me, being totally united on earth with the Father aspect of Me, through the Divine Union of that couple. Their unity based on unreserved love brings forth absolute harmony and Divine Love that gives life, nourishing each soul, giving it the essence of Divine Love, wisdom, truth and comfort. You can say that the Mother aspect of Me leads all souls into the complete union with Me - their Father. The masculine spirit of Me and man is automatically protective of the femininity in woman and within the Godhead. As a result boys are drawn deeply towards their mothers, and long to find a wife or companion as steadfast and loving as a mother. A mother's love is therefore crucial in the growth of a young boy. If a mother rejects a boy, it is like a boy is orphaned from Me, so deep is this attachment. This incidentally is true of daughters and their Fathers. The masculine aspect of Me is adventurous, and even likes the thrill of taking a difficult challenge, which is why an educational system without adventure is dangerously inadequate for boys. Furthermore, I am continually exploring, since I created an expanding and evolving universe. Some men and women have an irresistible desire to explore which is usually included in the masculine aspect of the Will, or part of My determination. At the very center of Me is a deep bond of love between masculinity and femininity. The mother's love, the feeding of the infant after birth, is not just a physical act, but offers the baby the spiritual protection and warmth of heart that the presence of the mother alone can give. The mother in turn has given everything to carry the child, giving it birth and nurturing it after it is born. It was My plan that a baby should be born into an environment of all-embracing love, welcomed into a perfect world of love. The beauty of femininity lies in its depth, in the very spirit and soul of the mother, and is demonstrated by her nature and movement. The perfect feminine nature of sacrificial love is eternally attractive to the masculine aspect being simply adorable. It is a law of My nature. This creates in the masculine heart a perfect desire to serve and protect the feminine nature. The father would perfectly uphold and honor the position of the mother, and likewise the mother would uphold and honor the position of the father. By honoring the father who honors her, she is also honoring herself, creating a scenario of double protection. The restoration of the Divine Nature within mankind is also the reason for the long history of the restoration of mankind. Some people will want to dispute the idea of the perfect nature within mankind. Jesus, as mentioned previously, himself said, "Be ye therefore perfect, as your Father who is in heaven is perfect." The real question facing people is not whether they want to believe this or that, but whether they want to live according to the best standard possible - which is to perfectly live with Me, their Father and Mother God. The creative idea, the will, the determination, the capability to explore are all part of the masculine aspect of Me. The creative act, the healing touch of the Holy Spirit, the compassionate love of the mother are all examples of the feminine aspect of Me. These are not only complimentary but are also seen in all people to some degree or other. I am the Supreme Being containing all elements in perfect balance. You all derive your being from Me - The I Am. In order to stimulate life, I divided up the elements within Me - the Godhead, creating male and female aspects. The elements within the Godhead are not separate however, just as the seasons of the year have no clear demarcation, but winter cannot be confused with summer. Within the Divine Nature of Human Beings is the sense that all children and mothers need to be protected. The natural innocence of children is part of the holiness of the human race derived from Me. Those who would seek to destroy the innocence of children for commercial, or other gain, have sinned against the human race and against Me - the Creator of all life. The masculine aspect of Me is a just aspect, and wants to straighten things up and get things on the right track. Every generation knows instinctively that they should live perfectly with Me. Now is the time to manifest it. In the Godhead, I, the Father, am totally dedicated to the protection of the Mother aspect and this is why it says in the Bible that the sin against the Holy Spirit is such a grievous sin and warrants no forgiveness. Just as here on the earth, woman - made by Me - is the bearer of children, so the mother aspect in the Godhead gives life to all souls, and people are born again through the Holy Spirit or Mother aspect of Me based on the extreme Divine Love which exists within Me, your Father and Mother God. I am a unique eternal being and am one in heart, mind and spirit. The Father and Mother aspects within Me do not dominate one another but exist in complete harmony, united through Divine Love to complete My totality, a full infinite expression of eternal, omnipresent love. When man and woman are united in Divine Love which comes from Me, they honor and respect one another as they are totally one in heart, mind and soul. Being in the image and likeness of Me on earth, they will be Divine Parents, and their off-spring will reflect the love of Me, and the harmony between the Parents and children will be beautiful to observe. This is truly the perfection that Jesus mentioned would come on earth. When man and woman are married in Divine Love from Me, there is no dispute between them at all, because I am always there between them guiding and protecting them throughout their lives. My Divine Love extends into all the children that are born from the parent's unity and love of Me. This is the total salvation of the family. You are living in the day when this complete salvation will be given to mankind by Me. Those who are wise will pray and become like a child before Me and ask forgiveness. I am waiting for all people to do just that. The more humble people are, the happier they will be, for this is the time which I spoke about when I said the day would come when people would see Me face to face. Certainly the meek shall inherit the earth. A child likes to learn new things. I hope that you all can heed the words spoken so long ago and make them a reality in your lives. I am real, not a far-off God sitting on a throne, but a Father and Mother God who longs to be with My children [You and me] twenty-four hours a day, seven days a week throughout eternity.